Everytime when one talks of Guru Dutt, one remembers his classics like Pyaasa, Kaagaz ke Phool, Sahib Bibi aur Ghulam and Chaudvin ka Chand. Then in further conversation one talks of Mr. & Mrs. 55, Aar-Paar and Baazi. One even remembers Jaal and Baaz. But Sailaab is one movie of his, which is mentioned only in few biographies. Nasreen Munni Kabir’s famous documentary on Guru Dutt also fails to mention it and jumps from Mr. & Mrs. 55 to Pyaasa. Abrar Alvi also doesn’t refer to it in Sathya Saran’s book “Ten Years With Guru Dutt – Abrar Alvi’s journey”. It is listed there at the end in Guru Dutt’s filmography, where only the film title, year of release and the main cast is mentioned. 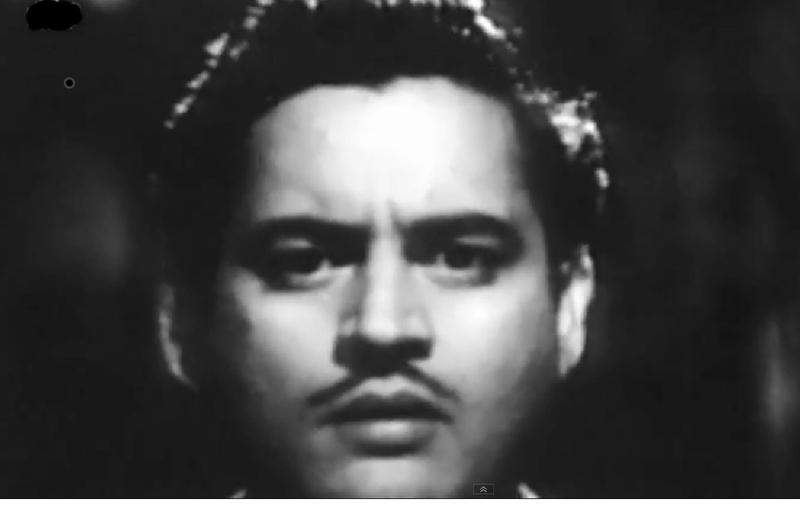 As you might have observed, I was also oblivious of its existence, while I did the Guru Dutt Series on my blog. Not totally oblivious, I just thought that it was a shelved project like Gauri. The first time I read of Sailaab was in Wikipedia. The entry under Sailaab is quite detailed and also provides a synopsis, which is identical to that at Upperstall. 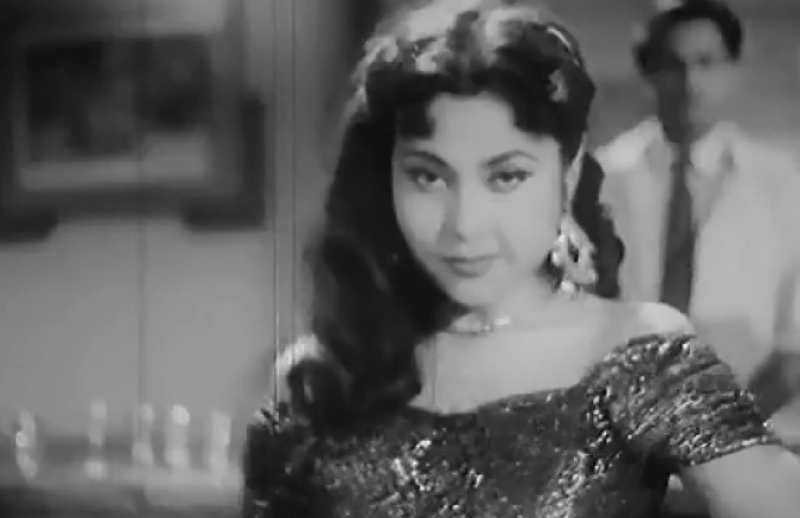 Wikipedia informs one further that the film was produced by Geeta Dutt’s brother Mukul Roy and since the film was a flop, she had to declare personal bankruptcy. Baburao Patel is supposed to have described it as boring, stupid and incoherent. He finds it to have been made without imagination and sees it as a perfect instrument of torture. The movie stars Geeta Bali, Abhi Bhatacharya, Smriti Biswas, Helen and Bipin Gupta. An interview with Smriti Biswas and her memories of her work with Guru Dutt can be read here. 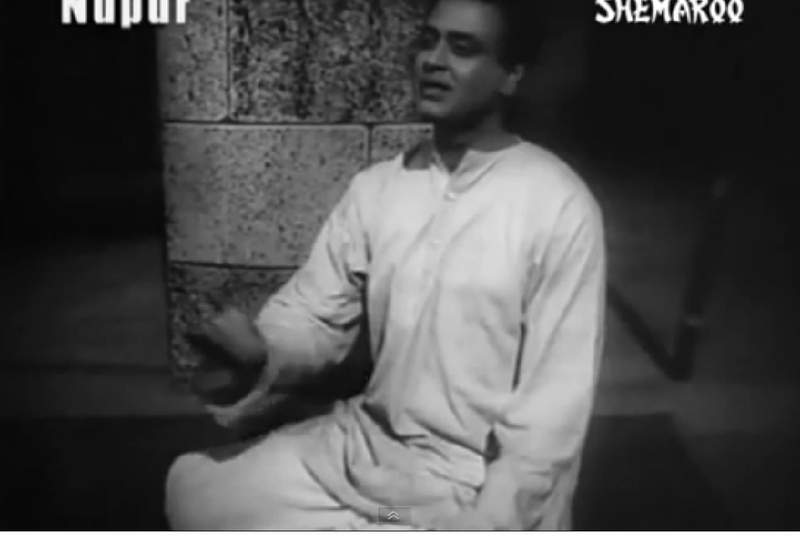 The Wikipedia lists the 10 songs for Sailaab (1956). The music director is the producer himself, Mukul Roy. 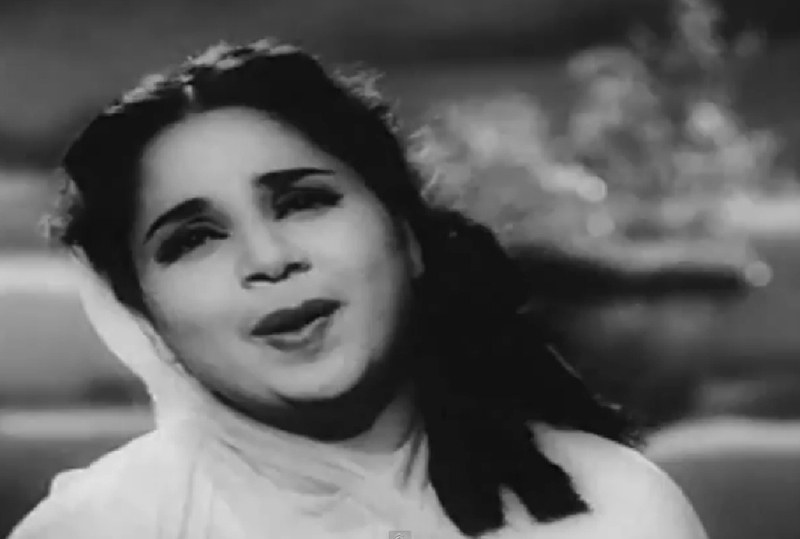 The lyrics are by Majrooh Sultanpuri and Hasrat Jaipuri. This source names other lyricists as well viz., Shailendra and Madhukar Rajasthani. The song listed as Chand ke Aansoo Shabnam Bankar sounds to my ears chandani aansoo shabnam ban kar. It is mostly probably sung by Kanchan (Geeta Bali) after Gautam (Abhi Bhattacharya) leaves her and moves to Calcutta and loses his memory once again and doesn’t return back to her. This is all that I could get to this film. I couldn’t find a VCD or DVD, when I was in India last time. It seems the film-maker Anurag Kashyap, who wanted to make a biopic on Guru Dutt also never managed to get hold of this film. He calls it the missing link. Sailaaab is also the name of the Madhuri Dixit film with Aditya Pancholi, where she gyrates to humko aaj kal hai wearing a Koli costume. I am somehow sure that this film is not one of the peaks in Guru Dutt’s career. All the same I would have loved to watch it. The above information is all that I have to this film. Do you know more about Sailaab? I would be very grateful for any information that you could provide. I hadn’t even heard of this film, Harvey! It’s odd that it should have sunk so, without a trace except for the audios of those songs… after all, the songs are good, and the cast weren’t non-entities either. And as for Baburao Patel’s assessment of it, I can think of a lot of other films – some of them which were actually pretty well-known – that could also be described as incoherent, boring and stupid! You are right, the songs are not bad, not as good as in Guru Dutt’s films post Aar-Paar, but good all the same. As for Baburao, although his critics are amusing, they don’ tcarry much of weight for me. If you go to the link provided under his name above, you will see what he had to say about some really good films. Like for C.I.D, he said: CID is not merely an unpleasant crime tale. It is a stupid crime tale. It is thin as air and as unconvincing as a Russian prisoner’s confession. I also liked the Smriti Biswas interview. The anecdotes were very nice and informative. The other interviews on the site are good as well. Here is another account of a meeting witth her by an Upperstall blogger. But not many anecdotes. It is really a shame that movies like this can just sink.I am sure someone somewhere has some information about it. But I think, if Anurag Kashyap can’t find it… can anyone else? You are right, Ava! It does make one sad. Not that its existence would have filled my life with happiness, but it is sad to see the neglect. And mind you this is not a film from an unknown director with unknown actors. It was directed by Guru Dutt, who is held up as the torch of new Indian cinema! If his works are neglected, what about others? Yeah, that is what I was thinking as well, if Anurag Kashyap didn’t get it then hum kis khethi ke muli hai? Thanks for shining the spotlight on a little known film, Harvey. I must confess I had never heard of this film at all. The songs are nice, not great, but pleasant enough to hear. However, did Guru Dutt direct it himself? Thank you, Anu for the nice words! There isn’t much to shine the spotlight on, though! Yes Guru Dutt seems to have directed it. In all the listings I have seen Guru Dutt is credited with the direction. But I don’t know if he really put in efforts or not. Abrar Alvi, his right-hand man of sorts doesn’t mention the film, even in passing, although he talks about other projects. Just like Nasreen Munni Kabir, he switches from Mr. & Mrs. 55 directly to Pyaasa, before which he tells the story of discovery of Waheeda Rehman and how the character of Gulabo came into being. It seems he knew a prostitute named Gulabo and so on and so forth, but not a word about Sailaab. I loved reading Smriti Biswas’ interview. Also satisfied my curiosity about the pool in ‘Anmol Moti’. So it was at their own house. The site, Cineplot.com does seem to have an interesting archive of interviews, to be delved into later. As I read the part where she talks about Anmol Moti, I had to think of you! The site does have some intersting interviews, at least they sound so! Yesterday, I read the one witth Prema Narayan. I didn’t know that she was a primary school teacher. Am curious how the other interviews turn out to be! At times they do give intersting piece of information! My immediate recation on coming here was…wow a Guru Dutt film I’ve never heard of, and harvey gets to see and review it. How lucky is that? Could this be the film that killed all Guru Dutt’s self confidence that he asked Abrar Alvi to direct SBAG? There’s a story going that it was actually Guru Dutt who directed SBAG, but he considered himself so unlucky that he asked Abrar Alvi to lend his name as the director. I’ll be repeating what everyone has said (it deserves being repeated) that the interview link was superb. Hope the film gets unearthed. I wish I was that lucky! No, this was released in 1956 and came between Mr. & Mrs. 55 and Pyaasa. The year when CID was released and sometime the year before Waheeda Rehman came into Guru Dutt’s life. MAYBE this was the pivotal factor, which turned against Sailaab. MAYBE he was fed up with Geeta Dutt’s so called possessiveness and fascinated by the new love in his life, that he didn’t pay much attention to his wife’s project. Also the fact that he didn’t have his own crew (Abrar Alvi, Raj Khosla) around may have contributed to this action. But the question remains, why this film sank without a (visual) trace? I believe that since the film was not produced under his banner, it didn’t get that much exposure. It is also possible that the co-producer Mukul Roy was so much disillusioned and angry with Guru Dutt, that he threw away the film. But as I said they are all just speculations. So if you ever hear anything about the film, please do tell me! The cineplot site is good, isn’t it? I hope, I can explore it more soon! I am happy and surprised – in equal measure – to chance upon this site. I was looking for some material on Sailaab which was scripted by my father, Nabendu Ghosh. He also wrote the screenplay of Aar Paar and was the author of the original story that became the classic, Kaagaz Ke Phool but did not credit him as the writer. (This entire story is published in his autobiography, Eka Naukar Jatri/ Journey of a Lonesome Boat, published by Dey’s, February 2008). You hit the nail when you say, Waheeda Rehman was the factor why he practically disowned Sailaab. Shilpi Bose is also right: Guru Dutt had announced Gauri as a peace offer: Kaagaz Ke Phool had ripped through their marital life, Geeta had hit the bottle, Nabendu Ghosh had gone to Film Writers Association which was then helmed by Guru’s mentors Phani Mazumdar, and they suggested that instead of warring on, Guru should proceed with Gauri which would have Geeta (lead actress), Nabendu (writer), and Kanhai Chitrakaar (art director). Guru announced it, but when nothing moved for months, everyone realised what to make of it. Kanhai Chitrakar got a spiritual call and went away to Vrindavan where he established his own studio and came to be recognised as an eminent artist. Thank you, Ratnottamaji for the comment. I am very sorry for looking at this comment so late. We have to be grateful to your father for many beautiful scripts like Parineeta, Bandini, Sujata, Teesri Kasam, Lal Patthar and Abhimaan to name a few. These are the films, which I cherish a lot. To know, that Sailaab was scripted by Nabendu Ghosh makes me even sadder, that we have lost it. Is his autobiography available in English too? It is so sad to see that the private matters can so influence the Art, but even the greatest artists are humans. Thank you for the information, which you have kindly shared with us. I can’t seem to remember where it was that I read references to this film — that Geeta Dutt’s brother got her to produce the film and at some point it ran out of funds and she pleaded with her husband to finish the film – I don’t know who the original director was. I wonder if any other Guru Dutt’s team members were at all part of the filmmaking process – like Murthy. This is interesting, I had vaguely heard about this film. As for Gauri the gossip in the industry those days- which I heard much later after I had grown up- was that GuruDutt was never serious about completing Gauri. But then the question is why did he start the film? well I have no clue. I think Gauri was a presitigious project for Guru Dutt. It was after all supposed to be the first cinemascope movie. S. D. Burman had already composed songs for the film, at least one of which was used afterwards in a different movie. Pancham recycled nearly all his songs, which he compsoed for Raaz, another Guru Dutt project which was shelved nearly twice. The book : GEETA DUTT:THE SKYLARK was publishd in 2008. The film Sailaab has been discussed in the pages: 161-163 and 198, exclussively from Geeta Dutt”s point of view. Welcome to my blog, Haimantiji and thank you for recommending your book! I am so happy that you should come and leave the above note. The book sure is a big help for me and also a good source of information for the readers. Am really curious as to what she has to say about it. I skimmed though your site. It has many valuable information.You are the first one, who gives a bit of information on Sailaab. I will see if I can get the book through Amazon, otherwise I will wait till my next visit to India. I would like to share a review about Guru Dutt. please advise if i can do it. The reason I am asking for permission is that I believe in following a protocol. of course you can share it. is it a review of a film? Have you watched 12 O’clock? I would love to see that film, but I haven’t watched it as yet. I read a review of it at anu’s blog and it sounds very interesting! I’ve watched part of it, and it’s actually quite good 🙂 Not as angsty as some of his other roles, and I haven’t seen anything sexist in it as of yet. Thank you, geniosity, for your kind words! Hi, Pramod, I think I remember you said that you are a fan of Guru Dutt. This is good. You should have been a film critic! You flatter me Gayatri! I think anybody could write about his or her insights about the films they like. That is the advantage of blogs! Pramod, you know me better than that! I never flatter anyone. Tell me what motive will I have to do that? Remember I told you I had met your Mom in the beginning of my career as a journalist? At that time she asked me why you had left India and not taken up a journalistic career like I had. You have potential. That is what I wanted to say. Phir blog ki baat lo. Many people use blogs to say whatever they want. But you are actually analyzing the movies in the way a critic would. At the beginning of my career even I have done critiquing. So I know. I couldn’t get a VCD or DVD of this film, that is the gist of the article here.